When it comes to steaks, the best cuts you can get come from the Longissimus dorsi and the Psoas major. Commonly referred to as filet mignon or tenderloin, the Psoas major is a pair of shorter muscles that run below the steer’s spine and are the most tender pieces of meat on the steer. The Longissimus dorsi, which make up New York strips, run from the neck to the hip of the steer and is the second-most tender muscle. 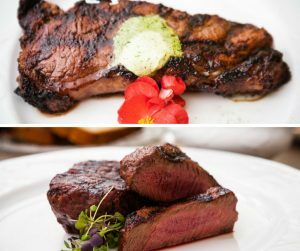 If you’re unsure as to which cut you should select next time you’re in the mood for steak, check out the differences of two of the most popular cuts of beef, which you can conveniently choose from at Shōgun Japanese Restaurant. New York strips are fine-grained in texture with medium fat content and are relatively tender with a bit of chew. They have good marbling, a robust beefy flavor and, because there are no large pockets of fat, they are easy to trim, cook, and eat. These flavorful, large hunks of meat are a favorite of Japanese steakhouses. Filet mignon is a small, compact melt-in-your-mouth tender piece of steak. The meat is very fine-grained in texture as well as low in fat, which makes it both buttery and mild in flavor compared to other cuts of meat. If you prefer a softer, thick cut of beef, filet mignon is a perfect choice. Regardless if you favor New York strip or filet mignon, the teppanyaki chefs at The Shōgun Japanese Restaurant will cook it to perfection right in front of you. We strive to ensure you and your guests receive a complete dining experience comprised of skill, taste, and entertainment. For reservations, please call 407-352-1607 or book a table online.